At the end of a sweltering June the Historical Association gathered in London for our annual awards evening. Each year this wonderful event is an opportunity to celebrate some of the people that make history happen across the country on a daily, weekly and monthly basis. For 2018 as the temperature soared history lovers of all genres and all levels from around the UK came together to hear who was being honoured. Thank you to Foyles Bookshop for a wonderful function room that was most importantly air-conditioned! First up were the Young Quills awards for Children’s historical fiction. There were three categories this year, with the children supplying the shortlist once more. Congratulations to this year’s winners! 2017 winner and 2018 judge Laurence Anholt (The Hypnotist) presented the awards and made an impassioned appeal to publishers and authors to eschew cosy establishment history and instead tell the unheard and uncomfortable stories of marginalised minorities. There were also congratulations to all of those schools that have achieved the Quality Mark in History in the last 12 months, as well as all those individuals who have taken part in the Teacher Fellowships (information about both of these and their recent achievements will be on the website over the next few weeks). Also this year we ran a pilot scheme for a brand new Chartered Teacher of History programme which will launch this autumn. We were delighted to celebrate the success of those who participated in the pilot. The evening ended with the presentation of the Medlicot Medal to this year’s recipient, Professor Justin Champion. The Medlicott Award is named after a distinguished past president of the HA, Professor W.N. Medlicott. The medal is awarded to individuals for outstanding services and current contributions to history. Justin Champion is a former president of the HA and a well-known and prestigious academic. Throughout his career Justin has been a keen and energetic advocate for public history and for wide public access to history. His many TV and radio appearances have ensured that his voice and work is known beyond the confines of academia. A regular on Melvyn Bragg’s In Our Time, Justin has made 17th-century political ideas and thought more accessible to many people. He has recently had the most enviable task of interviewing David Tennant for the BBC/PBS series Shakespeare Uncovered. Defacing the Past or Resisting Oppression? As is customary the Medlicott Medal recipient gives the guest talk for the evening. Justin Champion gave a fascinating talk on ‘Defacing the Past or Resisting Oppression?’ about the actions in recent years and months of removing or altering statues and public art depicting controversial historical figures and deeds. He expertly took the audience on a tour of statues that have been defaced to ones that have been updated, all to explore what the past and its physical representations can mean to current societies. Justin’s thought-provoking lecture will be made available shortly on this website. 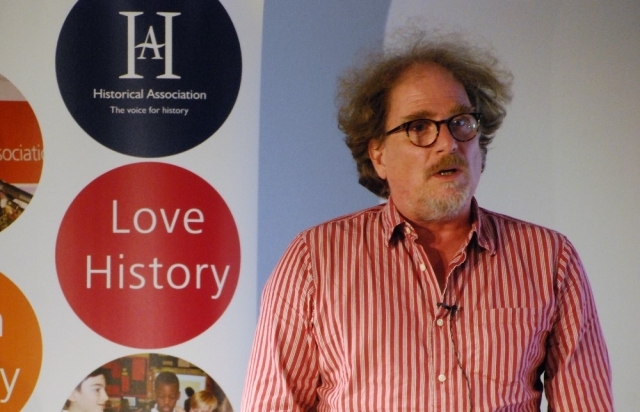 In the meantime you can watch Justin’s 2016 lecture ‘London’s Dreaded Visitation’ below, exploring the plague of 1664 and refuting the traditional account that rats and fleas were the culprits, and looking at why women suffered in greater proportion.